Hall of Famers Paul Darst and Betsy Leesman board the bus for the Safe House. The IDEA acronym was conceived by Paul Darst of the Houston Sports Associaiton in February, 1985 on a bus returning from the SAFE HOUSE Tavern in Milwaukee to the 3rd Annual Conference venue in Racine, Wisconsin. The acronym came first. Then, we had to figure out words for the letters: thus, Information Display & Entertainment Association. The former newsletter name, MATRIX, was suggested by Galen Armstrong, Seattle Kingdome, because it would relate to scoreboard displays and means a cavity in which things are formed or cast. The first MATRIX: Volume 2, No. 3, was published in November/December 1986. The first, unnamed, newsletter was published October 31, 1985. 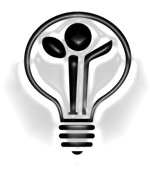 The IDEA light bulb logo was designed by Cam Steele, Winnipeg Enterprises (NHL Jets) and was first reproduced in Volume 2, No. 3 of the MATRIX. The acronym IDEA graphically reproduced in dots was first published in Volume 2, Number 1, September 1986, MATRIX, though I can't find any documentation on who designed it. The Golden Matrix Awards were first proposed during the 6th Annual Conference (New Orleans: February, 1988) by John Cunningham of Mitsubishi. In the November, 1988 issue of MATRIX, (Volume 3, No. 6), it was announced that Sony had joined as co-sponsor and the first awards would be held at the 1989 Anaheim Conference. The first competition resulted with awards in four categories: Best Music Video (Seattle Kingdome), Best Matrix Board Display (The Ohio State University), Best Use of Existing Equipment (The Ohio State University) and Best Overall Video Display (Oakland Athletics).